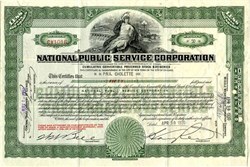 Beautiful Cumulative Convertible Preferred Stock Certificate from the National Public Service Corporation issued in 1930. 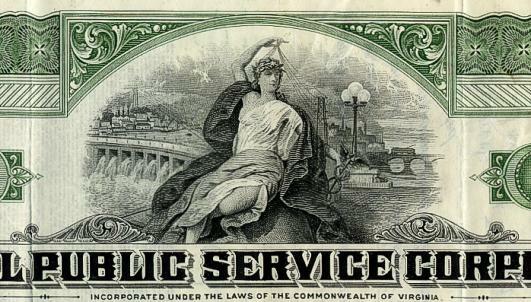 This historic document was printed by Republic Banknote Company and has an ornate border around it with a vignette of an allegorical woman holding up power lines with a dam and power plant in the background. This item has the signatures of the Company's President and Secretary and is over 78 years old. This corporation acted as a holding company for a number of power utilitiy companies during the 1920's and 1930s.